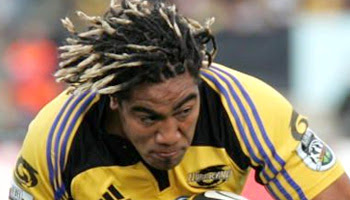 The 2004 Super 12 game between the Hurricanes and the Highlanders produced one of the biggest hits ever to be seen on a rugby field. It looked like man against child when Ma'a Nonu lined up Ben Blair and smashed him into next week. Blair took a while to get up after being flipped onto his back like a rag doll. You'd too after having the wind knocked out of you with a hit like that. SIDENOTE: We managed to dig this one out of the vaults thanks too it being listed in the Requests section here on RD, so if you think of any other classics please list them there. Also, thanks to the guy who asked for it. Enjoy watching it again. I know I certainly did. awww he got completely wasted!! Complete mismatch and a hospital pass = BOOOOOOOOOOOOOOOOOOOOOOOM! that was absurd!Blair is parallel to the ground at one point!!! Another fine example of Ma'a playing outstanding in the yellow jersey. If only he could string a few more performances like that together in the black jersey and he may jus fulfill his international potential. Think he's named for his Mom or his Dad? OUCH!! TATS GOT TO HURT! Maybe it was a misunderstanding. The official asked his mom, "Whats his name Maam?" wow thats even bigger than Brian Lima 's hit on Hougaard!!!!! Couldn't have timed it better!!!! that actually looks completely legal, he wrapped him with atleast one arm and kept it wrapped when he went down... the only thing is he didnt go down with blair in the takle, but dont believe that illegal! Could you hear the smack on that one!?!?!? My god...Credit to Blair for popping back up as fast as he did!